Italy became the first country outside of the U.S. to legalize the benefit corporation structure. The process for creating a new option for purpose-driven businesses serves as a model for other countries. When Italian entrepreneurs Eric Ezechieli and Paolo Di Cesare founded sustainability consultancy Nativa in 2012, they wanted the company to have a sense of purpose. Having studied the Gross National Happiness in Bhutan for his master’s thesis a decade earlier, Ezechieli says that, “Business is a tool, and we wanted to run a conscious business. The happiness of our people was paramount.”In their application to register the new company, the business statute included achieving “the happiness of all those who are a part of it.” The Chamber of Commerce of Milan rejected their application three times. The reason? Their purpose was not an acceptable reason for a company to exist. “They gave back our registration and single-handedly crossed out the purpose. Nothing like this had ever been written in a statute. They could not conceive of the fact that a company would focus on anything other than maximizing profit,” says Ezechieli. In 2013, Nativa became a Certified B Corp, and the founders became familiar with benefit corporations that were becoming a legal option in several U.S. states. 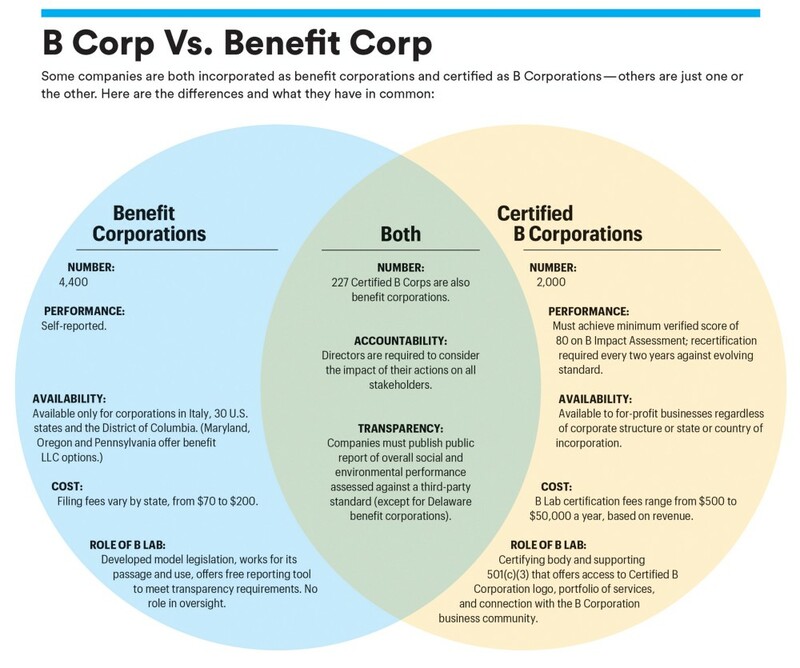 (Here’s a useful graphic showing the differences between B Corps and benefit corporations). Ezechieli approached a forward-thinking politician he had known for several years, Senator Mauro Del Barba, with a challenge: Could a new legislation, like that in some U.S. states, help make Italy a place for businesses looking to make a positive impact on society? The first step was to test the waters. In 2014, Senator Del Barba, together with Ezechieli, got a chance at the annual convention of the PD, the democratic political party in Italy. “We shared the idea of a benefit corporation with a mixed group of politicians and citizens. I remember one citizen’s reaction: ‘How great if, for once, politics led business with a solution,’” says Del Barba. The enthusiastic feedback gave him the confidence to put forward his first legislation as senator. The legislation would create a new definition of a company, called a “società benefit” (or benefit corporation), a company with a double purpose: distributing profits and pursuing a common good. Modeled on the benefit corporation laws in several U.S. states, the Italian benefit-corporation law has some additional robustness, such as the enforced oversight of the country’s antitrust authority. Once the legislation became law in early 2016, Ezechieli and Di Cesare registered Nativa as the first società benefit in Italy — with “happiness” in its corporate statute. “We have provided the playing field with the legislation. It’s now up to the players — the business owners — to put it to use and show how Italy believes in sustainability,” says Del Barba. Now, over a year later, an estimated 100 benefit corporations are registered in Italy, with more registering every month. In December 2016, Italian B Corps and benefit corporations came together in Milan to celebrate the “founding class” of these purpose-driven businesses. Bundling. The Italian group made a fortuitous choice to write the legislation as an amendment to an existing lawmaking process (the Legge di Stabilità, the annual national budget policy), rather than as a stand-alone law. This sped up the approval, as amendments do not need to be rewritten if the main law is modified, and the budget process works on a firm deadline. “Bundling [with the budget process] is the main reason this law passed in a matter of months and not years,” says Ezechieli. Simplicity. Del Barba points to the ease of implementation. As it didn’t offer tax breaks, the new law had no cost for taxpayers, and no new burden for the government (beyond the standard antitrust controls), which made it an easier sell. Authority. Finally, Del Barba cited the fact that benefit-corporation laws had already passed with bipartisan support in many U.S. states, and included the support of well-known academics. “When we showed that Stefano Zamagni (a well-known Italian economist) and Nobel laureate Robert Shiller supported B Corps, it gave legitimacy to those who didn’t know the concept,” states Ezechieli.